I would like to post from time to time about our homeschooling experience, since I'm just starting out. As I've mentioned before, I LOVE homeschooling! We've been using Sonlight curriculum for going on 3 years now. I really, really like it -- most of the time. There have been a few issues that we've had to deal with, but I can get into those in future posts. We had several of these books already and therefore did not need to purchase them this year. Although I've often wished we would have and we could have given them as gifts. I'll just focus on a few of the books to whet your appetite! My Father's Dragon. This book was actually recommended to us by our very close friends and RR's best friend. 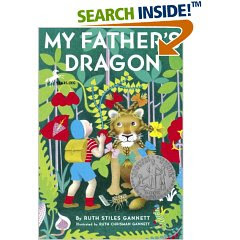 It's about a little boy, Elmer Elevator, who travels to rescue a baby dragon from Wild Island. He takes with him lollipops, combs, chewing gum and many other unusual items to help him in his quest. He ends up using them all! As an aside, Elmer Elevator lives in Popsicornia. My daughter, Energizer Bunny (EB), has a new imaginary friend named Popsicornia! Elmer succeeds in his quest and he and baby dragon prepare to leave. Unfortunately, that's where the book ends. We could never leave Elmer on Tangerina (where he and the dragon flew after Wild Island), could we? So, we picked up the sequels at the library -- Elmer and the Dragon and the Dragons of Blueland. We thoroughly enjoyed all of them. We finally meet Boris' family (the baby dragon of My Father's Dragon fame) and see them safely left alone in the Blueland mountains. Even EB understood a lot of this and it was fun family time for all. The Light at Tern Rock. We have just finished this book and it's engaging and didactic at the same time. 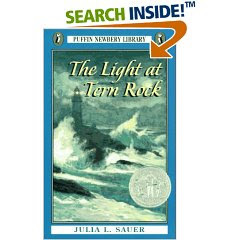 It's about a young boy (Ronnie) and his aunt who are asked to fill in for the lighthouse keeper at Tern Rock for about a week. Ronnie is excited but hesitant as he wants to make sure he's home in time for Christmas. He is assured, by the lighthouse keeper, that he will be. December 15 (the promised pick-up date) comes and goes. By December 23, they realize that they will be spending Christmas on Tern Rock. Then on December 24, a discovery is made that challenges Ronnie's faith in mankind. This is a great work for discussing injustices with your child. I plan to read this many, many times with my children. We could have a different type of discussion each time. Maybe in my next post, we'll discuss some of the other books. I'm so glad you discovered My Father's Dragon and its sequels. It was a family favorite of ours when we were growing up! I can't wait until my son is old enough to enjoy it.